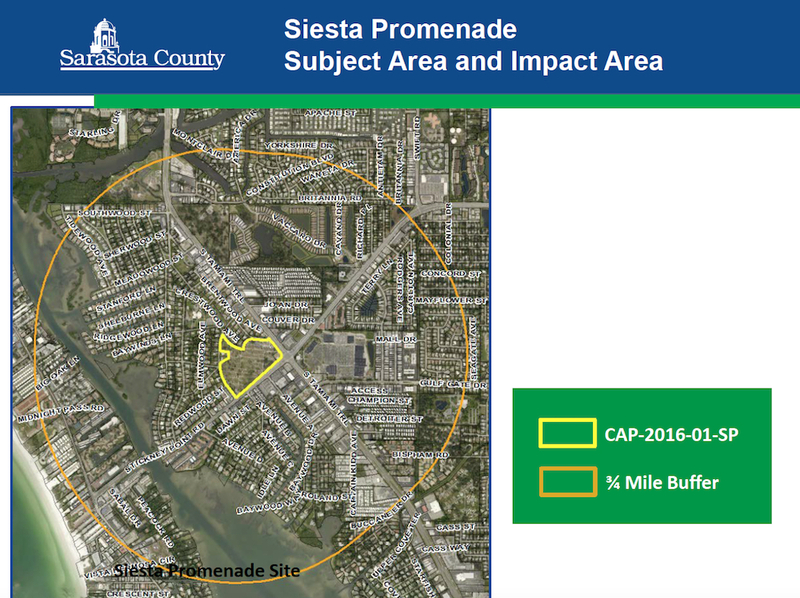 In January 2017, a Sarasota County resident with years of expertise as a planning board member and a consultant who served as a senior Sarasota County planner for 22 years first raised an issue about Siesta Promenade that never has been addressed. In August 2016, Benderson Development Co. filed papers with the county’s Planning and Development Services Department staff, outlining its proposal for the mixed-use project at the northwest corner of Stickney Point Road and U.S. 41. To enable the firm to build up to 600 condominiums/apartments — as initially announced — the company applied for a Critical Area Plan (CAP) designation for the project. That would allow it to construct 25 dwelling units per acre. 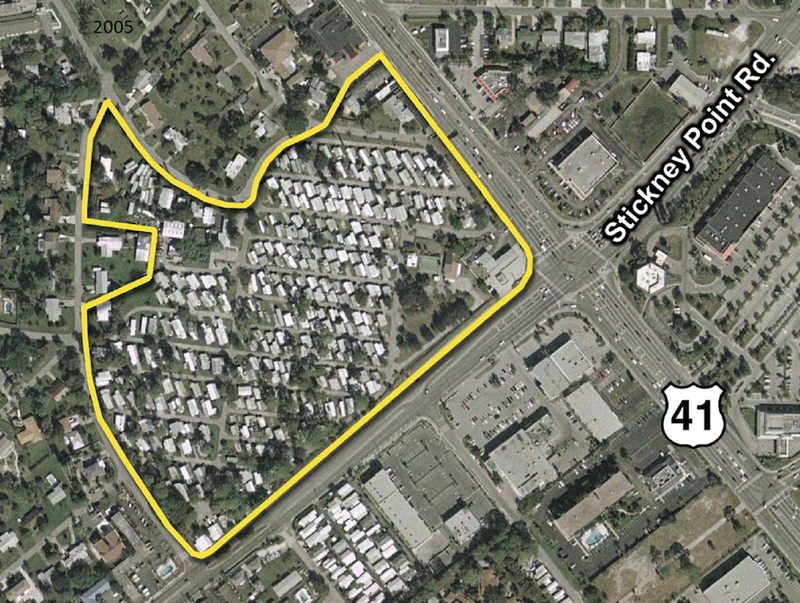 The county’s Commercial General Zoning District provides for up to 13 dwelling units per acre. Later, Benderson revised its plans to call for 414 condominiums/apartments. Still, the current zoning for most of the approximately 24 acres of the Siesta Promenade site would allow only up to 300 mobile homes, Todd Mathes, director of development for Benderson, explained to about 110 people packed into the Parish Hall of St. Boniface Episcopal Church for the June 2, 2016 meeting of the Siesta Key Association. The company also has proposed a 130-room hotel — with each room counting as half a dwelling unit — plus 133,000 square feet of retail space and up to 7,000 square feet of office space. Both Sura Kochman, leader of the Pine Shores Neighborhood Alliance — who has had years of planning board experience in New Jersey — and Brian Lichterman, the former county planner, have explained that establishing the boundary for a CAP should be the first step in the process for an applicant to win approval for that CAP designation. In an interview on Jan. 25, 2017, Lichterman told The Sarasota News Leaderthat the purpose of establishing that boundary is to insure that all of the important changes a proposed development will bring to a specific area will be addressed. The boundary not only is intended to encompass the area of the project, he pointed out, but also the most affected surrounding areas. Yet, Benderson Development has sought a CAP boundary that just circles its site at Stickney Point Road and U.S. 41, Lichterman said. “This is a critically important, regional intersection,” Lichterman stressed. When she addressed the commissioners, Kochman, a Pine Shores resident who has lived part- or full-time in the county for the past 60 years, held up a copy of what she called the “flow chart” designed to lead to approval of a CAP. “It clearly notes that there should be a decision by [the commissioners] on a CAP boundary before the application can proceed,” she said. 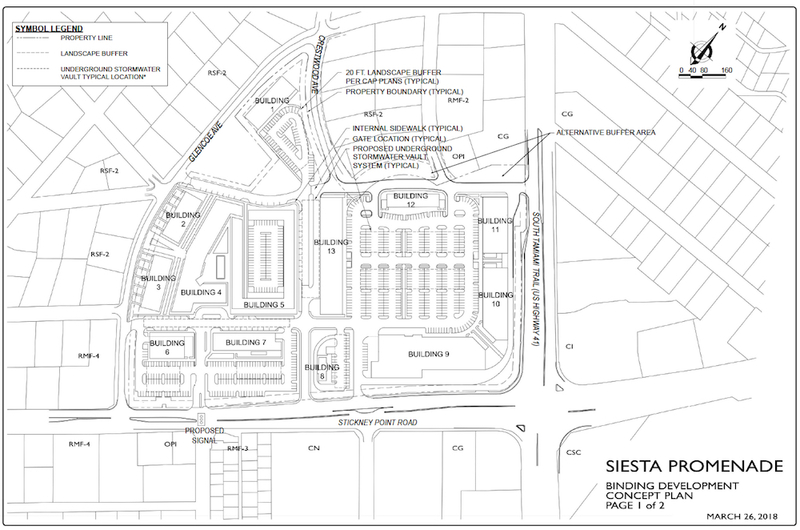 Pine Shores Estates abuts the Siesta Promenade site. Yet, with the first public hearing on Benderson’s petitions for the Siesta Promenade project about six weeks away, nothing has been done to resolve the CAP issue, Kochman pointed out to the News Leaderthis week. The county’s Planning Commission is scheduled to consider the Siesta Promenade proposal during its regular meeting on Nov. 15. The County Commission has set aside its entire Dec. 12 meeting for a public hearing on the Benderson applications. Representing the Best Western Plus Siesta Key Gateway Hotel, which is located at 6600 S. Tamiami Trail — close to the Siesta Promenade site — Sarasota attorney Morgan Bentley of Bentley & Bruning wrote a letter to Deputy County Attorney Alan W. Roddy on Sept. 12 regarding the CAP issue. Roddy typically represents the Office of the County Attorney during hearings related to issues such as rezonings and Critical Area Plans. 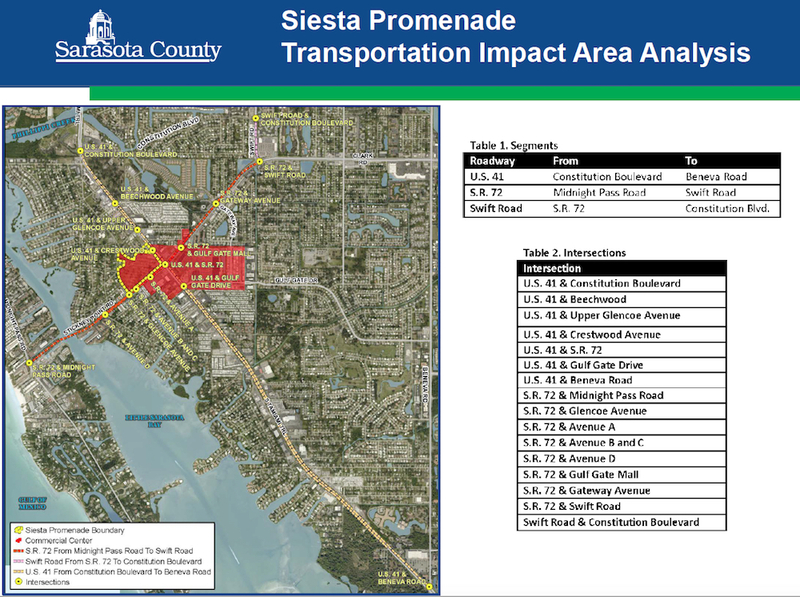 He was present on Jan. 25, 2017 when the commission approved a scope of work for the Siesta Promenade process, which included an analysis of traffic on the roadways and at the intersections in close proximity to the project site. 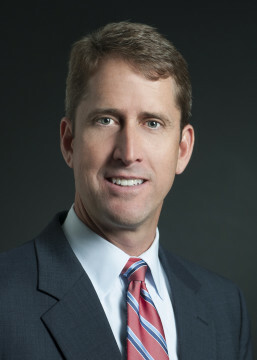 “Given the procedural posture, it seems the better procedure would be to follow the CAP Ordinance and approve the Boundary after reviewing the response to the Scope of Work, then at a separate hearing, consider whatever rezonings the Applicant (or Applicants, if the Boundary expands) may seek inside the CAP,” he added. Bentley received no answer from Roddy, as Kochman pointed out in an Oct. 2 press release. He received no response to that letter, either, Kochman said in the news release. Starting on Nov. 5, City Commission to start its regular afternoon sessions an hour earlier, at 1:30 p.m. Outstanding article. Thanks for bringing this complex project into understandable view. Kudos to Mr. Morgan and Siesta Key Gateway Best Western. Elements of an Access Management Plan are not been provided which would protect surrounding neighborhoods and ensure traffic impact is not intensified. to the neighborhood with low impact design, retaining native surroundings and green space, accessibility for pedestrians and traffic management that will not intensity safety risks. It’s naturally beautiful and makes sense to create a best practices use of this property. I chair the Ad Hoc Government and Community Liaison Committee at Pelican Cove. I will be presenting our committee’s concerns with the development to our board workshop on Tuesday. any additional inforation you can provide, specifically about he traffic issue from Stickney Point to Beneva along I 41 would be most welcome. We are at Vamo Rd. juset off 41 and Beneva. Thanks so much to SNL for keeping us informed on the Siesta Promenade project. Thanks, also, to Sura Kochman who has relentlessly followed this since it was first proposed.